Thanks again to our aviation history and news scout, Virg Hemphill, we can share this fascinating step back into airline history, into the pre-WWII era of the 1930’s. The age in which we said farewell to Art Nouveau, the Roaring Twenties and romantic novelists like F. Scott Fitzgerald – all for a new, yet still romantic age of rapidly accelerating technology, especially in aviation, which saw many beautifully designed modern airplanes begin to ply the skies in every corner of the globe. America’s own Pan American Airways was one of the most aggressive and pioneering of those who helped so astoundingly shrink the size of the world as we had once known it. Thanks to Juan Trippe’s (CEO of PAA) pioneering entrepreneurship, what had taken passengers to the Far East from California over a month aboard ship, now took less than three days in one of his now classical beauties, the famed PAA Clipper Ship airliners. Hopefully those frequent-fliers among you might genuinely appreciate this nostalgic look back in time at the fabled Pan Am Clipper! Without further ado, let’s look at those great flying machines of yesteryear . . .
Pan Am Clipper passengers enjoying their meal in the ample dining room aboard the ship. 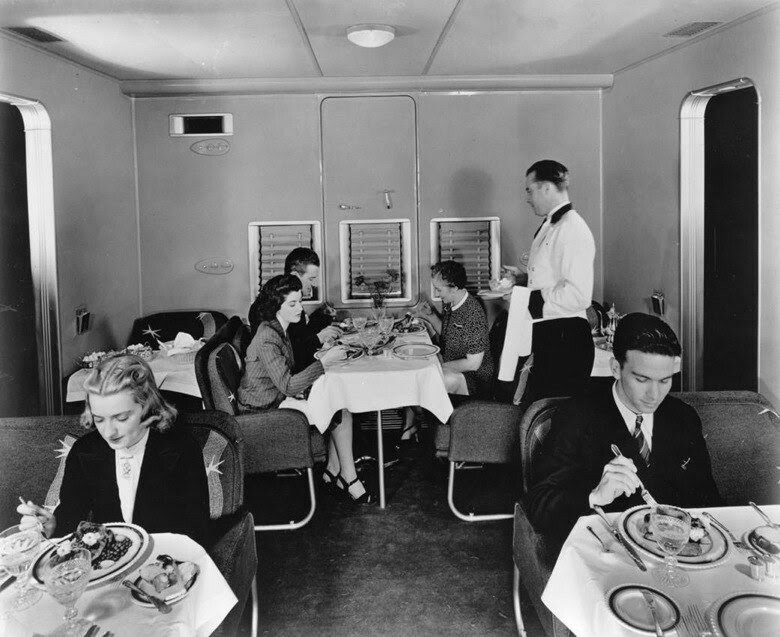 Clipper passengers took their meals at real tables, not their seats. For most travelers in the 21st century, flying is a dreary experience, full of inconvenience, indignity, and discomfort. Boeing model 314 takes off for transoceanic flight. 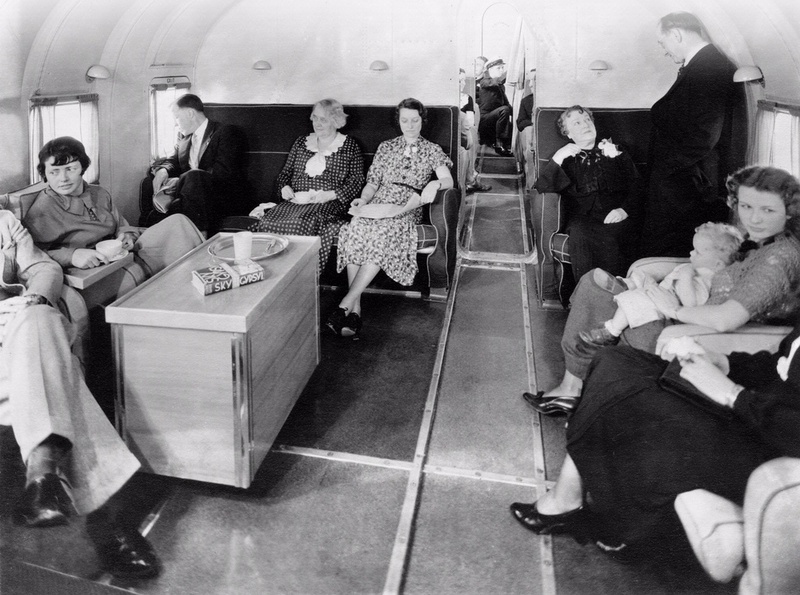 Even Franklin Roosevelt used the plane, celebrating his 61st birthday on board. Between 1938 and 1941, Boeing built 12 of the 314 (see above) jumbo planes for Pan American World Airways. PAA purchased only three of the predecessor Martin 130s. The Clippers had a range of 3,200 miles for the smaller Martin and 3,500 miles for the larger Boeing models — enough to cross either the Atlantic or Pacific, with the 314 having enough room for 74 passengers on board, or almost twice as many as the smaller Martin. Of course, modern aviation offers an amazing first class experience (and it’s certainly much safer), but little in the air today matches the romanticism and Pullman styled luxury of crossing the oceans in the famed Clippers. The nickname “Clipper” came from an especially fast type of sailing ship used in the 19th century. The ship analogy was appropriate, as the Clipper landed on the water, not runways. One of a Clipper’s private staterooms. 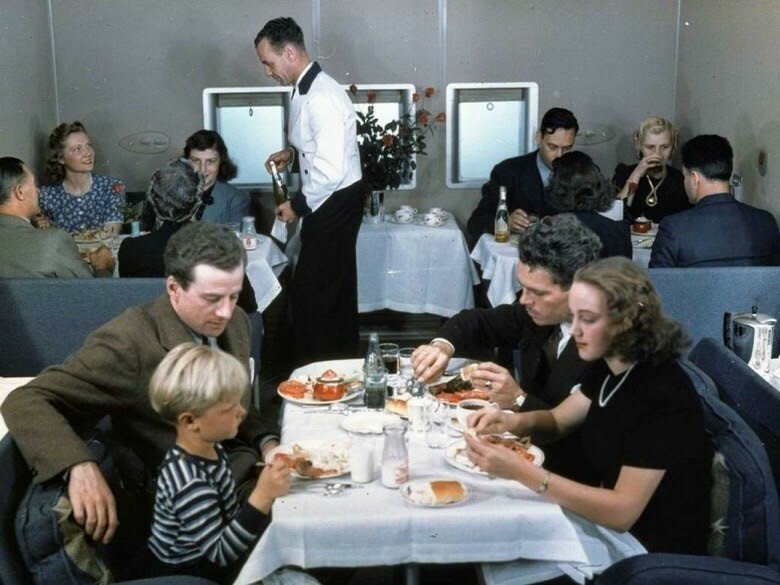 On the Pan Am flights, passengers had access to dressing rooms and a dining salon (below) that could be converted into a lounge or bridal suite. Clipper Dining Room with passengers eating in restaurant style comfort. The galley served up meals catered from four-star hotels. If you want to sit at a table to eat with other people these days, you’ll have to fly aboard a private jet. There was room for a crew of 10 to serve as many as 74 passengers on the larger Boeing Clipper, with but 36 day passengers aboard the Martin and only 18, if configured for sleeper use. Bunk bed or typical berthing arrangement aboard the Clipper Ships. (Above) On overnight flights, the Boeing’s 74 seats could be turned into 40 bunks or berths for comfortable sleeping. 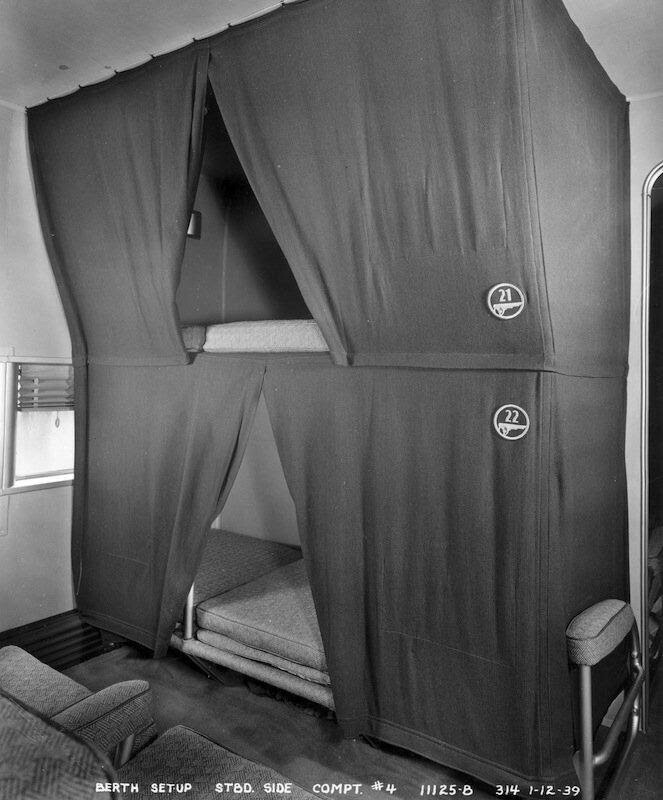 The bunk beds came with curtains for privacy, just as on the Pullman rail cars of the era. 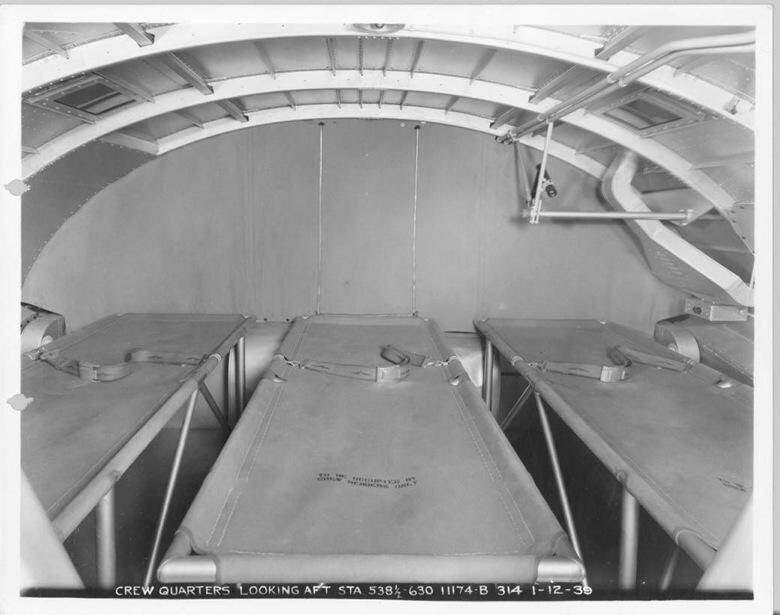 (Above) On the more than 24-hour flights across the Atlantic or Pacific, crew members could grab some shut eye on these less than luxurious cots. 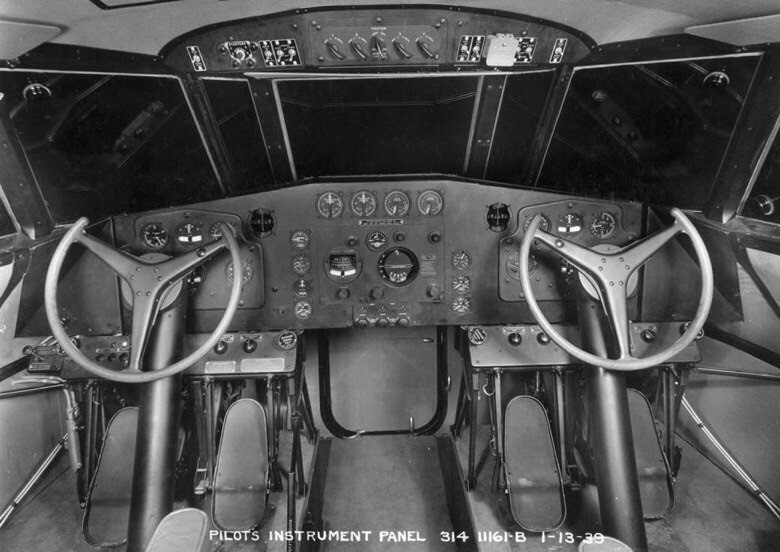 (Above) Unlike some modern jets that come with small joysticks mounted to the pilots’ side, the Clipper had flight controls that most closely resembled automotive steering wheels, which control column style predominated even into the jet age. In the 1930’s, navigating across the oceans required more manpower, such as specialized radio officers and highly trained navigators, as seen above. Today’s jet airliners need neither of these extra crew members because the pilots do both the navigating and radio communicating with modern high tech equipment such as GPS, and they communicate with satellite-based long range radio. The wings on the Boeing Clipper were so thick, that a crew member catwalk was provided to enable in-flight inspections (See photo to the right). 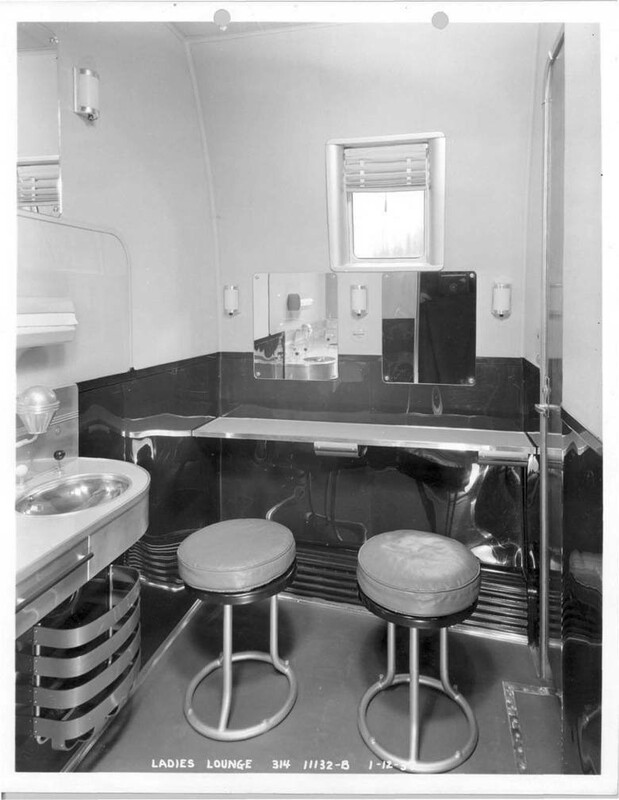 (Above) A standard restroom aboard the Clipper, but note the separate urinal, which is missing in today’s airliners. 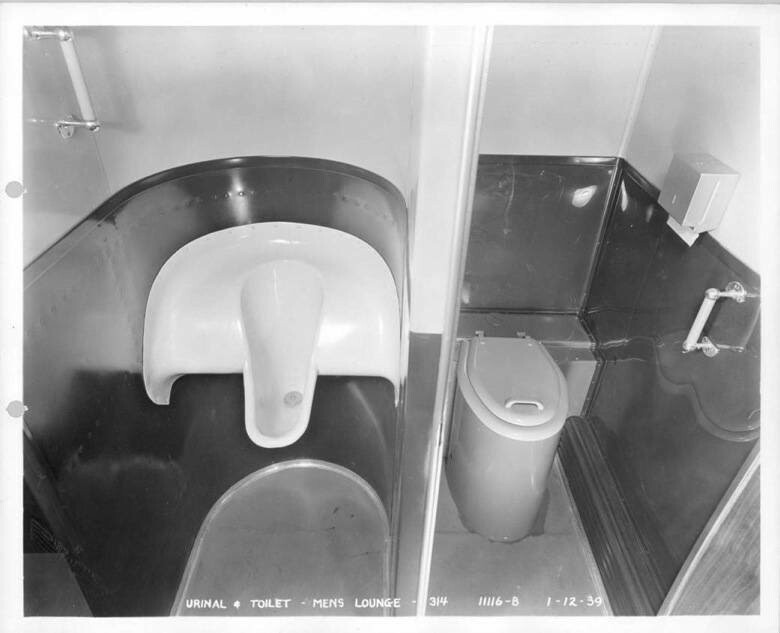 While the lavatories weren’t too fancy, they did have separate urinals — something you never see in today’s commercial jets, where space is at a premium. (Above) The ladies lounge had stools where female passengers could sit and take care of their makeup. The Boeing 314 Model made its maiden trans-Atlantic flight on June 28, 1939. But once the US entered World War II, all of the Clippers were pressed into service to transport materials and personnel. While only three (3) of the earlier Martins had been delivered to PAA, and one, the Hawaiian Clipper, had disappeared over the Pacific, the other two were conscripted by the U.S. Navy. However, both of those two remaining Martin 130 Clippers tragically crashed with tragic consequences (loss of life). 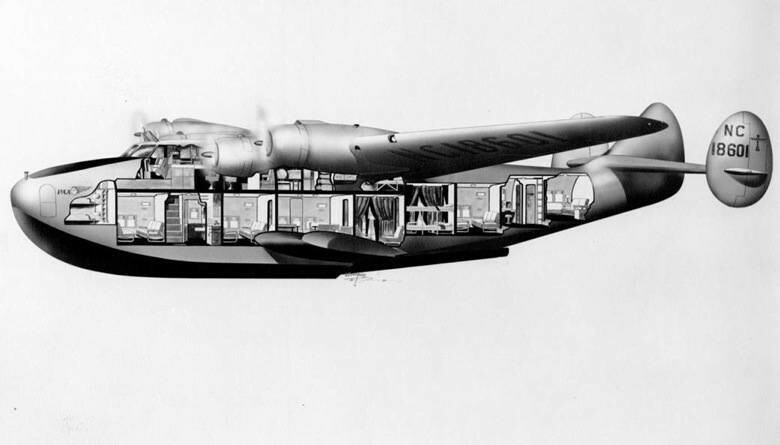 Interior cutaway drawing of the Boeing model 314 Clipper. China (Martin Model) Clipper at the PAA Dinner Key Seaplane Base, Coconut Grove (Miami), Florida. Your webmaster was once thrilled to pilot a Grumman Albatross Seaplane into this once famous seaplane terminal, but was never privileged to have even seen one of the renown Clippers. 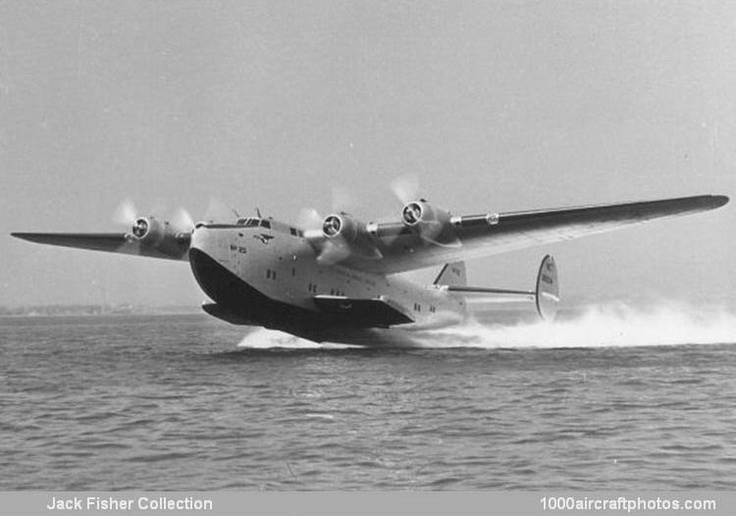 Boeing 314 Clipper breaking water on take off. Note the triple tail compared to the single Martin tail design. 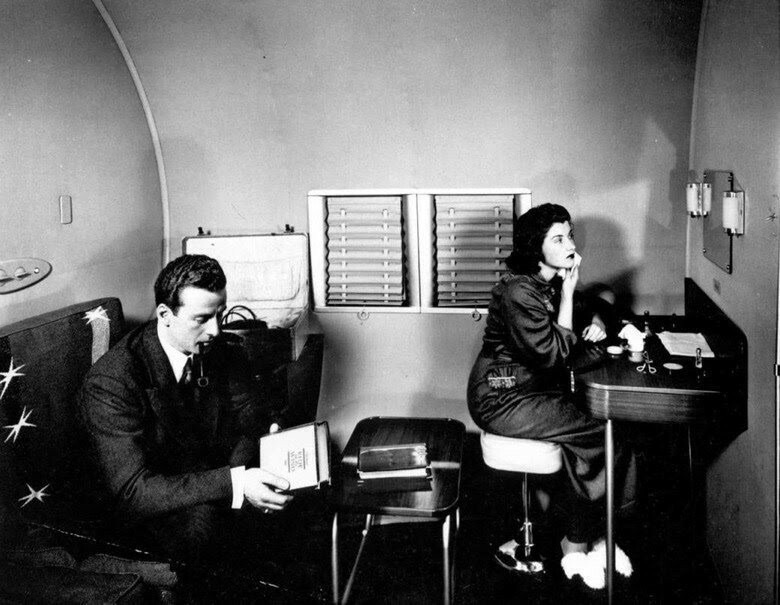 Interior photo of the passenger lounge in the Martin China Clipper. Here, above, you see the mysterious “Hawaiian Clipper”. This is the very ship that vanished over the South Pacific, giving birth to a number of theories about her actual fate. See the postscript that follows these photos and also the Aviation History Magazine story about this tragic 1938 aviation mystery. Large or high resolution photo from LIFE magazine of the PAA Martin 130 “China Clipper” Ship. Martin 130 China Clipper at anchor mooring. 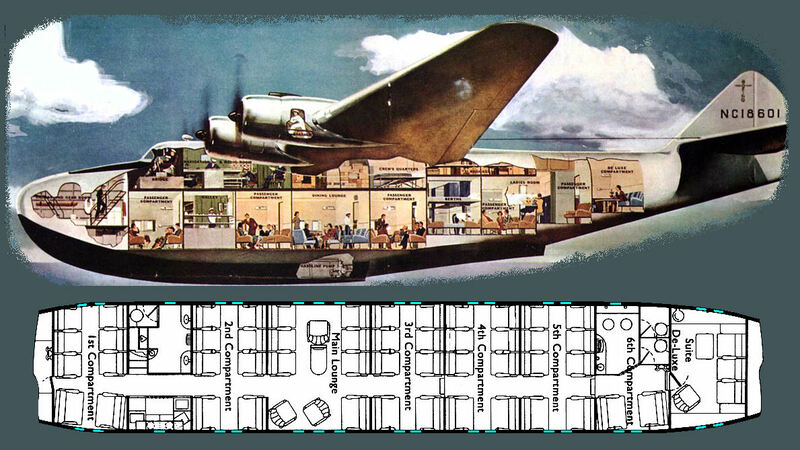 Martin 130 China Clipper cutaway drawing showing its interior. Martin 130 China Clipper undergoing maintenance. Another LIFE Magazine photo of PAA’s Martin 130 “China Clipper” – High Resolution. The flight officer’s size provides a good perspective of ship’s actual size. Remember, any of these high resolution photos can be seen in full size by simply clicking on them. The China Clipper moored off shore near the Philippines? If you have evidence this craft is moored somewhere other than the Philippines, we’d love to know where it is, but we think it’s near Manila. The PAA “China Clipper” taxiing to its mooring in San Pedro Harbor, Los Angeles, California, circa 1939. Postscript: Prior to WWII, the Japanese Military became very interested in the new and powerful Pratt & Whitney radial engines that powered the Martin Clippers. On a flight from San Francisco to China, a Clipper landed on Truk Lagoon to be refueled by Japanese authorities. Later, the Clipper was assumed lost over the Pacific. Years later, it was revealed that the crew and passengers were arrested and executed, the engines were retrieved and sent to Japan and the Clipper was sunk in deep water off Truk Lagoon. In the 75 years since the Hawaii Clipper disappeared, no one has figured out what happened to the flying boat and its crew. A few minutes before 6 a.m. on July 29, 1938, Pan American Airways Captain Leonard Terletzky taxied the Clipper out of Apra Harbor, Hawaii Guam. Terletzky was more than halfway through the six-day, 9,000-mile flight from Alameda, California, to Hong Kong. He’d already made stops in Honolulu, Midway, Wake Island and now Guam. Manila, Macao and Hong Kong were still to come. The longest part of the trip (Alameda to Hawaii) was behind him. Half the passengers had disembarked in Honolulu, leaving only six to be ferried by Terletzky’s eight-man crew on the island-hopping voyage across the Pacific. Other than leaving Guam 29 minutes late, everything on Pan Am trip No. 229 was running smoothly. As Terletzky throttled up the big Martin M-130’s engines, the flying boat surged forward and began to skip across the wave tops. Fully loaded, the 52,000-pound aircraft needed 45 seconds to get airborne. Since the M-130 was just shy of 50,000 pounds leaving Guam, it took almost that long for it to clear the waves. The Hawaii Clipper was a thing of beauty. An all-metal, high-wing flying boat with a riveted hull, it was 91 feet long and 25 feet high, with a 130-foot wingspan. One notable feature was its sponsons, or sea wings, near the waterline. These improved stability on the water, replacing the wing-mounted pontoons found on many other flying boats. In addition to providing aerodynamic lift, they kept ocean spray off the tail surfaces during takeoffs and landings. When Juan Trippe, Pan Am’s CEO, set out to establish the world’s first transoceanic air service, he needed a flying boat with greater range, speed and payload than the Sikorsky S-42 the company was then flying. After a design competition between Sikorsky and Glenn Martin, Trippe settled on ordering three Martin M-130s at a cost of $417,000 apiece. Pan Am’s transpacific service was the first of its kind when it kicked off in November 1935. Though it was initially limited to airmail and freight, passengers followed within a year. The M-130’s four Pratt & Whitney Twin Wasp radial engines were important to its success. Any two of the 950-hp engines could keep the flying boat aloft. And with a 3,200- mile range, a cruising speed of 130 mph and a 17,000-foot service ceiling, the M-130 had the chops to cross the Pacific. The Hawaii Clipper had already enjoyed a notable career. Built in Martin’s Baltimore factory, it was the third of Trippe’s M-130s (the first was the China Clipper, the second the Philippine Clipper). 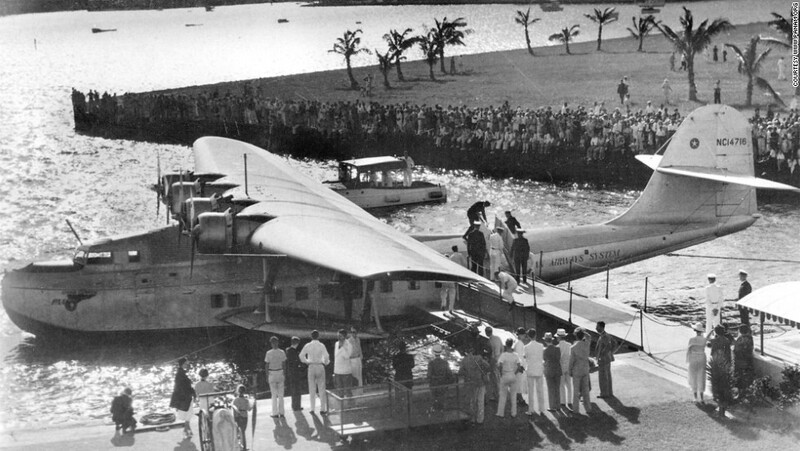 Delivered to Pan Am in March 1936, the Hawaii Clipper flew to Honolulu in May, where a 14-year-old girl fittingly christened it with coconut water. 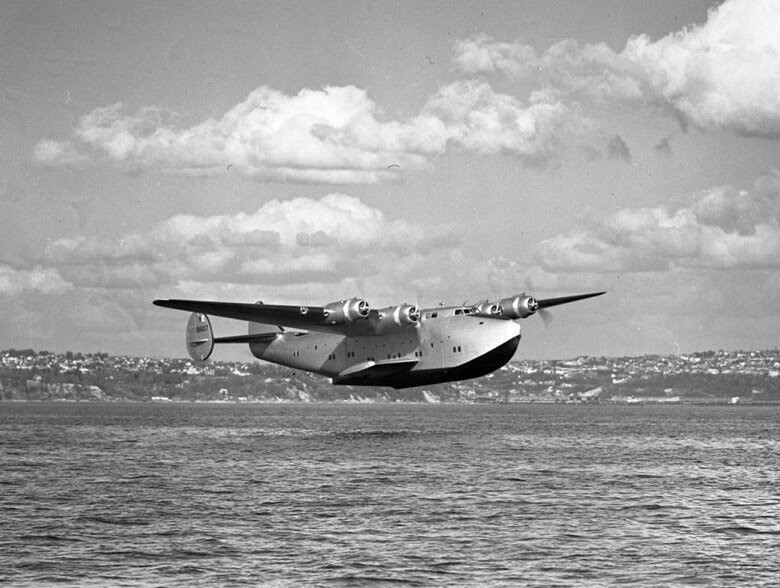 In October of that same year, the Hawaii Clipper completed the first scheduled passenger flight across the Pacific. Pan Am’s chief pilot, Captain Edwin C. Musick, was at the controls along with navigator Fred Noonan. That flight put Musick on the cover of Time magazine, helping to establish him as one of the world’s most famous pilots. Noonan gained notoriety the next year, when he served as Amelia Earhart’s navigator. Obviously, it was a mixed blessing. 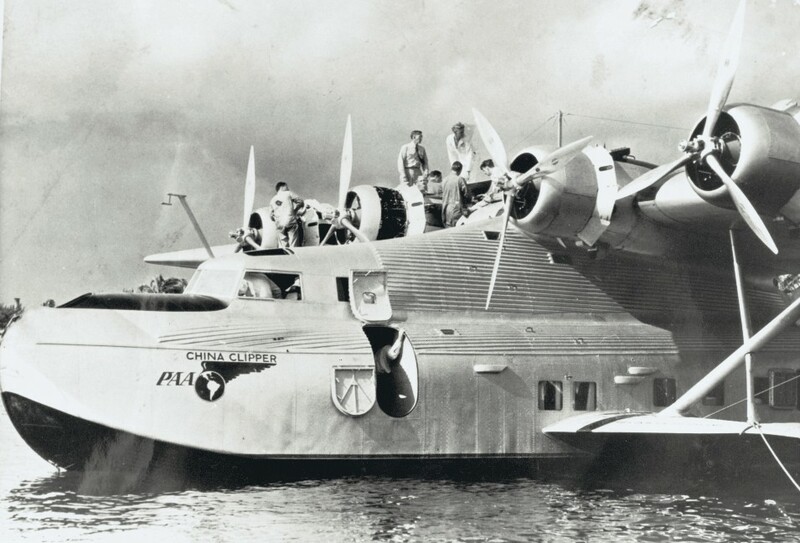 In April 1937, the Hawaii Clipper completed Pan Am’s 100th Pacific crossing without a single passenger fatality, a remarkable accomplishment given the risks inherent in transoceanic flight’s early days. Terletzky’s job in July 1938 was to uphold the airline’s reputation for safety and reliability. The 1,600-mile leg between Guam and Manila normally took 12½ hours. Since the Hawaii Clipper had enough fuel for nearly 18 hours in the air, there was a comfortable safety margin. Leo Terletzky was flying one of the era’s most advanced airplanes. The M-130 not only had dual flight controls and a double hull, but also a Sperry automatic pilot. The flying boat boasted six watertight compartments (any two of which could keep it afloat) and every conceivable safety device. These included three radios (a primary, auxiliary and emergency set), a saltwater still, hundreds of small balloons that could be released as search markers, inflatable life rafts, signal flares, a shotgun, fishing tackle and enough food to keep 15 people alive for a month. Four “international orange” stripes were painted on the wing tops, to help search and rescue personnel spot the plane if it was forced down at sea. Once the Hawaii Clipper was airborne, Terletzky settled back into his red leather pilot’s seat. As a senior captain, he had more than 9,000 flying hours, 1,600 of which had been spent over the Pacific in an M-130. He was also Pan Am’s “best sailor,” which meant he knew how to handle a Clipper on the water. One of the first pilots hired by Andre Priester, Pan Am’s famous head of operations, Terletzky had spent almost 10 years flying the company’s South American routes before he was transferred to the Pacific Division in 1936. 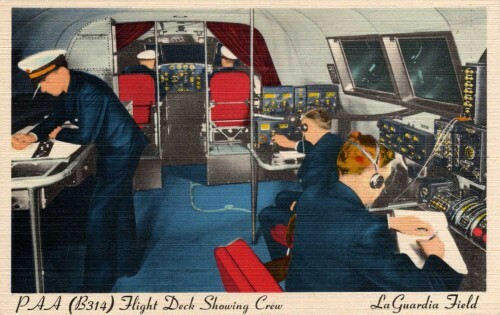 Pan Am’s pioneering use of multiple flight crews meant there was ample experience in the cockpit on July 29, 1938. First Officer Mark “Tex” Walker had more than 1,900 hours’ flying time, the majority in transpacific operations. Second Officer George M. Davis topped 1,000 hours of transpacific flight logged. Even the cabin steward, 40- year-old Ivan Parker Jr., was making his 26th Pacific crossing. Before departing Guam, Terletzky had learned of a slight tropical depression near the Philippines. Scattered thunderstorms were typical summer weather in the Pacific, but he played it safe and plotted a course south of the depression. 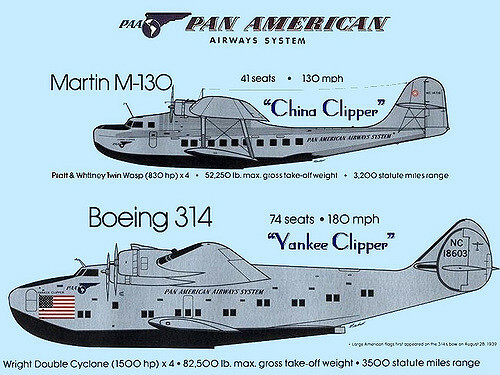 Pan Am’s Pacific Clippers were paradigms of luxury, with service modeled after that aboard Pull- man railroad cars. A round trip to Hong Kong (including meals and overnight hotels) cost a whopping $1,937 (roughly $32,000 today). But for luxury, convenience and speed, the Clippers couldn’t be beat. As noon approached that day, the cabin steward was busy preparing lunch: consommé, creamed tuna on toast and fruit cocktail. 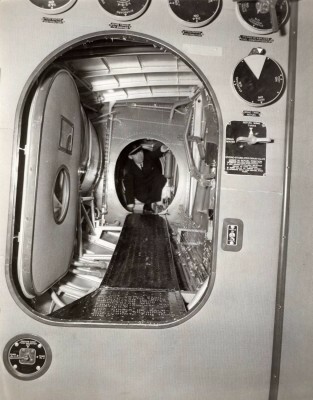 The aircraft’s main cabin was divided into several compartments. Sleeping berths were near the plane’s rear, with separate bathrooms for men and women. There was also a comfortable lounge amidships where passengers could stretch their legs, read or write letters. Smoking wasn’t permitted, but there was plenty of opportunity to play cards, backgammon or checkers, and conversation generally flowed freely in the 60 hours of flight time between California and Hong Kong. Given the ticket price, it’s no surprise the Hawaii Clipper’s passengers were a distinguished lot. Dr. Earl B. McKinley, a noted bacteriologist and the dean of George Washington University’s Medical School, was carrying two new serums to test at the Culion Leprosy Colony in the Philippines. Fred C. Meier was the principal plant pathologist at the U.S. Department of Agriculture in Washington, D.C. He too was on his way to the Philippines, where he planned to study disease transmission in the upper atmosphere. Kenneth A. Kennedy, Pan Am’s Pacific Division traffic manager, was making the flight to check out the company’s overseas operations, which had recently been disrupted by the Japanese invasion of China. Major Howard C. French, commander of the 321st Observation Squadron, was on his way to monitor the Japanese bombing of Canton. French wasn’t the only passenger with pro-China sympathies. Also aboard was 45-yearold Edward E. Wyman, vice president of export sales for the Curtiss-Wright Corporation. Wyman’s company wanted to sell fighter aircraft to the Kuomintang, something the Japanese would not have been pleased about. Perhaps the most unusual passenger was 38-year-old Wah-Sun Choy. An American of Chinese descent who called himself “Watson,” Choy was the wealthy owner of a small New Jersey–based restaurant company. He was so enamored with Pan Am’s flying boats that he’d named two of his cafes after the China Clipper. Choy was on his way to Hong Kong to visit his mother and sister, and also hoped to see his brother Frank, an air force pilot with the Nationalists. He was carrying $3 million in gold certificates (approximately $50 million today), which, as head of the Chinese War Relief Committee, he intended to donate to Chiang Kai-shek. Eduardo Fernandez, the radio operator on Panay Island, near the Philippine coast, acknowledged receipt of the message. But when he indicated that he wanted to transmit the latest weather report, McCarty responded: “Stand by for one minute before sending as I am having trouble with rain static.” Fernandez did as he was told. But when he tried raising the Hawaii Clipper 60 seconds later, there was no response. It wasn’t unusual for a plane to temporarily lose contact. 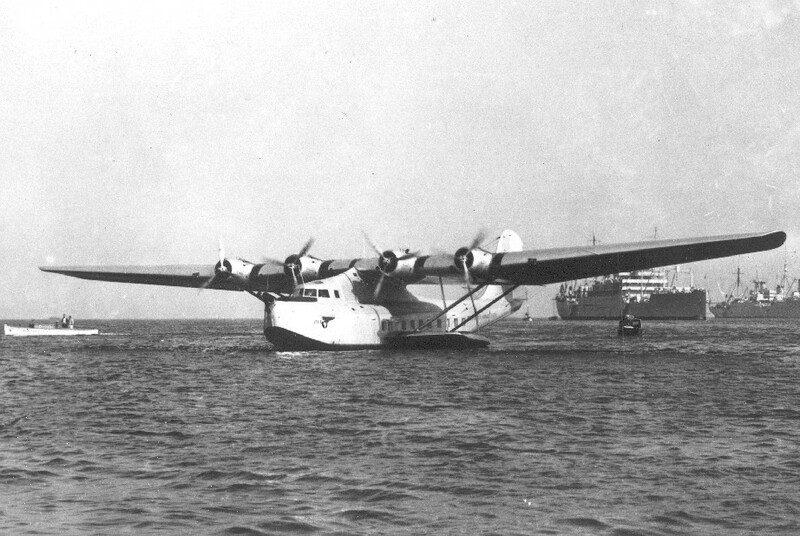 The Hawaii Clipper wasn’t due in Manila for another three hours, so Fernandez decided to wait before raising any alarm. But as time passed and he still couldn’t contact Terletzky’s plane, he grew worried. Clearly something was wrong. At 12:49 p.m. Fernandez alerted all stations to stand by on emergency frequencies. The Hawaii Clipper was missing. 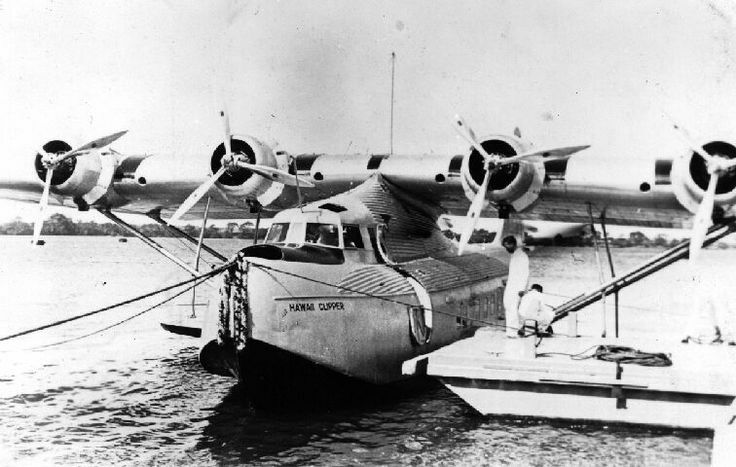 Since McCarty’s last reported position was only 300 miles off the Philippine coast, Pan Am expressed confidence that the Hawaii Clipper had landed safely in the water and would soon be found. When time passed and the flight failed to arrive in Manila, however, those hopes dimmed. The U.S. Navy immediately organized one of the largest sea searches in its history. By midnight that same day, at least 14 ships from Manila’s 16th Naval District, including six submarines and three destroyers, left port. Additionally, the U.S. Army dispatched six long-range Martin B-10 bombers to survey the flying boat’s last known position, while four amphibious planes scoured the Philippine coast. The Army transport Meigs, which had been only 103 miles away from where the Clipper presumably went down, immediately changed course. When the vessel arrived at the specified location at 10 that evening, it was raining and overcast. Still, Meigs’ crew started to search right away. By the time the destroyers arrived, the weather had cleared and the seas were exceptionally calm, with winds only 6 to 8 mph. In other words, conditions were ideal for finding debris from a plane crash. The next day Meigs reported finding a large oil slick about 28 miles south-southeast of the Clipper’s last known position. Samples were taken and sent for analysis. On August 2, Pan Am’s China Clipper retraced the route of its missing sister ship. Nothing turned up. Finally the U.S. State Department asked the Japanese government for help. Tokyo redirected the liner Canberra Maru to Douglas Reef, but its crew found no sign of the missing aircraft there. By August 5, when the search was suspended, more than 160,000 square miles had been covered. The samples from Meigs’ oil slick showed it was actually bilge water from a ship. The Hawaii Clipper had simply vanished. Pan Am offered a reward for information, but none of the resulting leads panned out. One man claimed to have seen an airplane burst into flames and crash into the Samar Sea. Another man on Lahuy Island reported seeing a large airplane flying above the clouds on the afternoon of July 29. An aerial search of both areas came up empty-handed. It had been a rough year for Pan Am. The Pacific Division lost half a million dollars in 1937. Add to that the loss in January 1938 of the Samoan Clipper—a Sikorsky S-42B flying boat that exploded in midair, killing everybody onboard, including chief pilot Ed Musick—and it seemed like Pan Am’s luck had run out. Though the Samoan Clipper wasn’t carrying passengers at the time, Musick’s death came as a shock. And now the Hawaii Clipper had gone missing. Martin’s M-130s had compiled an extraordinary safety record up to July 1938. A total of 228 flights had preceded the Hawaii Clipper’s across the Pacific, logging nearly 15 million passenger miles without serious incident. The missing aircraft had been thoroughly inspected prior to leaving Alameda and at Honolulu, Midway and Wake Island. Additionally, a Guam ground crew had hauled the flying boat out of the harbor for a detailed inspection, and everything appeared to be in fine working order. The day before the crew departed Alameda, it had even participated in an emergency landing test, including an “abandon ship” drill that involved deploying a life raft. Captain Terletzky and his crew had reportedly been in “the best of spirits” during their stopover on Wake Island. Nothing seemed out of the ordinary. Seventy-five years later, the question still remains: What happened? If the flying boat suffered a structural failure, wreckage would have been spread across the Pacific, and searchers should theoretically have spotted it. But the Clipper had simply vanished. Not a trace was ever found: no debris, no oil slick, nothing. Since then, there’s been no shortage of theories about what happened to the Hawaii Clipper. Some have speculated Japanese fighters shot it down. Others say it must have been sabotaged. After all, at least three of the six passengers aboard could have been construed as having anti-Japanese sympathies. Still, there’s no evidence to support either theory. Amelia Earhart’s disappearance in the Pacific the year before only added to the Clipper mystery. Retired U.S. Air Force pilot Joe Gervais was researching her disappearance when, in November 1964, he was shown the wreckage of a flying boat on the Pacific atoll of Truk. Believing it might be the Hawaii Clipper, Gervais forwarded photographs to Pan Am for examination. He was especially interested in stories that native guides told him about 15 Americans who had been executed by the Japanese before the war and buried under a concrete slab on a nearby island. 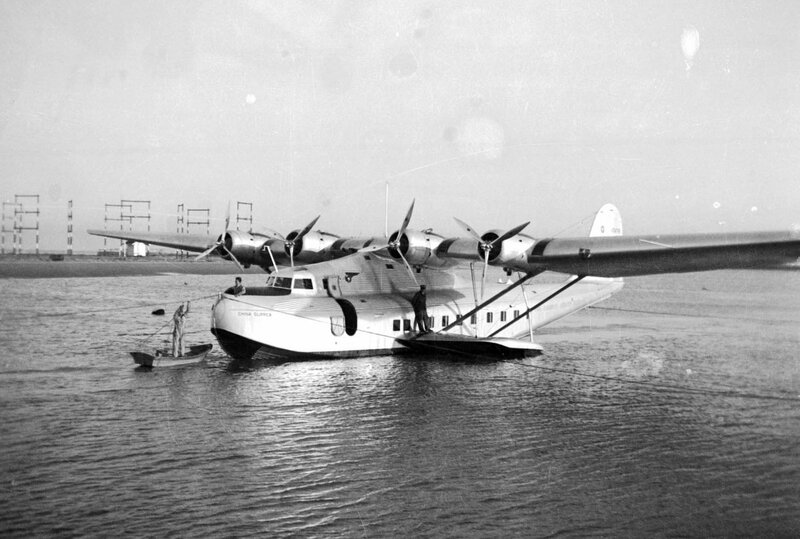 But when Pan Am reviewed Gervais’ photos, the wreckage proved to be that of a Short Sunderland flying boat. The story didn’t die there, however. In his 2000 book Fix on the Rising Sun: The Clipper Hi-jacking of 1938, Charles N. Hill wrote that he believed the Hawaii Clipper had been commandeered by two Japanese naval officers who had stowed away in the baggage compartment while the aircraft was at Guam. Then, armed with a revolver, they committed the world’s first skyjacking. Hill speculated that the officers had diverted the flying boat to a Japanese-occupied island and eventually to Truk, where the passengers and crew were executed. Motivation for such a hijacking has varied depending on the source. Some believe the Japanese wanted to copy the M-130’s design for their own flying boat, while others think they actually wanted to get their hands on its engines. Hill’s theory is that the Japanese were determined to prevent Watson Choy from delivering $3 million in gold certificates to Chiang Kai-shek. Guy Noffsinger, a former Navy intelligence officer who now heads up his own video production company in Washington, D.C., has spent the last 12 years trying to solve the Hawaii Clipper mystery. Noffsinger raised nearly $4,000 to fund a February 2012 trip to Micronesia, his second such journey to the region. Using ground-penetrating radar, he searched under several concrete slabs for the bodies of the Hawaii Clipper’s missing passengers and crew. Though he has yet to find evidence of their remains, Noffsinger is still “110 percent convinced” that they must have been murdered by the Japanese and buried near Truk. We do know that Martin had been concerned about the safety of the M-130’s sponson struts, and recommended replacing them. John Leslie, Pan Am’s Pacific Division engineer, had tested the replacement struts two months before the Hawaii Clipper disappeared and concluded neither the old nor the new struts were safe. The negative publicity surrounding that issue was probably responsible for Trippe’s never doing business with Martin again. After World War II there were rumors that American military officers had found the Hawaii Clipper painted in Japanese colors at Yokosuka naval base in Japan. A slightly different version of the story, often repeated by Trippe, was that magnetos bearing the same serial number as those from the Hawaii Clipper had been found on Japanese engines. There is no firm evidence for these claims. It’s possible Captain Terletzky may have been a factor in the plane’s disappearance. A 1938 company newsletter commemorating Terletzky called him “one of Pan Am’s most distinguished flight commanders,” but his peers considered him an average pilot at best. Some had even refused to fly with him. Horace Brock, who eventually became a Clipper pilot, had flown several times as Terletzky’s first officer. He claimed the Pan Am pilot had “confided his fear of flying” to him. Others maintained that Terletzky performed erratically in the cockpit and had infected his flight crews with his own anxiety. Ed Musick reportedly had serious misgivings about Terletzky’s competence, and once even tried to ground him. 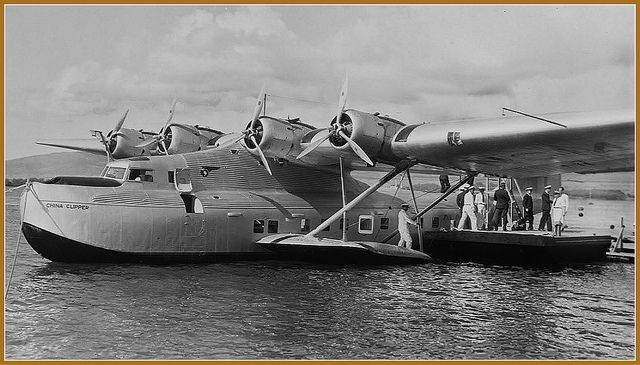 Despite the many elaborate theories surrounding the Hawaii Clipper’s disappearance, the most likely explanation is that the flying boat was a victim of mechanical or structural failure, poor weather, pilot error—or some combination of these factors. Though no wreckage was ever found, the Pacific is a big place. It can easily swallow a plane without any trace. Pan Am’s Pacific operations continued to face financial difficulties, something the Clipper’s disappearance did nothing to help. Even though the U.S. government would eventually grant a higher airmail subsidy to offset the company’s losses, there was not enough demand to make the route profitable. 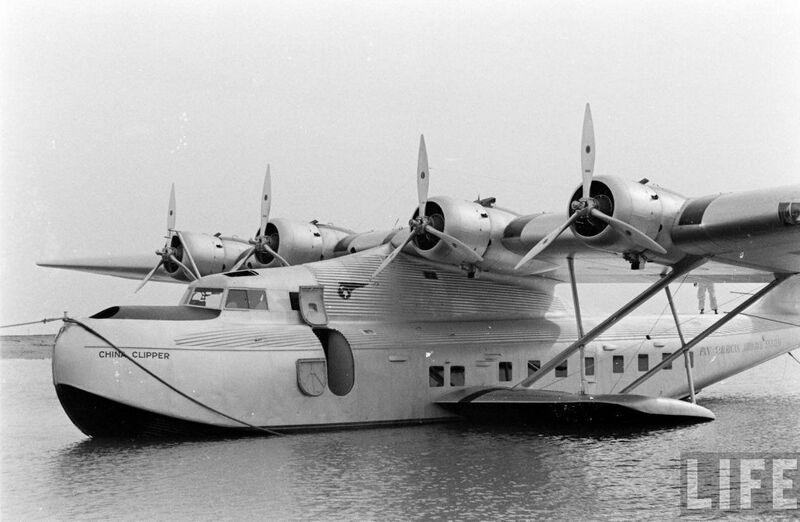 Trippe was deposed as CEO in 1939, and Pan Am’s M-130s were soon supplanted by Boeing’s larger B-314 flying boats. But World War II finally put an end to the Clippers’ short, glamorous career. In 1979 Horace Brock noted in his book Flying the Oceans, “There is no question but that [Terletzky ran] into a very bad storm.” Perhaps the turbulent weather caused a catastrophic structural failure related to the sponson struts. It seems unlikely we’ll ever know for sure. But until someone comes up with conclusive evidence, it’s easier to assume the Hawaii Clipper succumbed to what Brock calls “a predictable tragedy” than to believe it was hijacked by renegade Japanese officers. Either way, the Hawaii Clipper mystery lives on. John Geoghegan writes frequently about unusual aviation and science topics. His most recent contribution to Aviation History was “Atomic Airships” (January 2013). He is the author of the 2013 book Operation Storm, about Japan’s I-400 submarines and their Seiran aircraft. For more on the Hawaii Clipper mystery, see lost clipper.com. Originally published in the November 2013 issue of Aviation History. To subscribe, click here. This entry was posted in AVIATION NEWS on December 4, 2017 by FASFRIC. Looks great to me except an unseeded apostrophe here: 130’s. On the other hand it seems the original author should keep his byline (currently has your fasfric byline). Editors often must engage in significant editing/rewriting and fact-checking, but the person who contributed the story still keeps the title. Since nobody enjoys editing, to save some degree of upset, I suggest sending your edited version back to writer for their final approval before publishing.